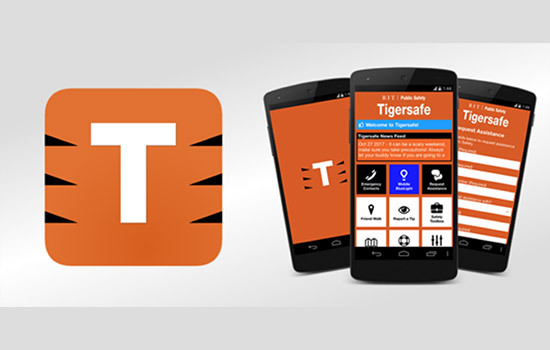 The TigerSafe app is now available for members of the RIT community on Android and Apple iOS devices. The mobile app is designed to inform, report and assist users on campus. Rochester Institute of Technology is offering a free app that’s bringing safety right to your fingertips. 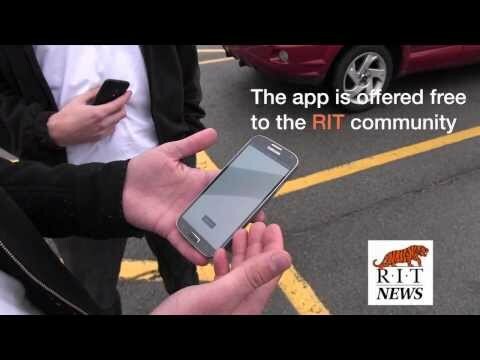 The new TigerSafe app allows campus users to connect with RIT Public Safety officers, turning any smartphone into a virtual blue light security phone. The mobile app developed by CampusSafe LLC, founded by RIT student Eric Irish, adds onto traditional blue light offerings by featuring voice and text capabilities, GPS location tracking and reporting services. The app is now available to download for free on Android and Apple iOS devices. RIT community members can sign into the app using their university username—no separate account needs to be created. • Inform allows access to Public Safety’s general and emergency response phone numbers, other important RIT phone numbers and safety tips. This tab can be used by anyone who downloads the app, including parents, and does not require an RIT account. • Report allows users to report the need for jumpstarts, noise complaints, escorts and lockouts without having to call Public Safety. Reports show dispatchers the user’s GPS location. • Assist offers a virtual blue light button that a user can press in the event that they feel unsafe on campus. This reports the user’s location, contact details and information to Public Safety communications officers. After pressing the button, Public Safety is dialed to continue the conversation via telephone or text message and aid in response. “Public Safety is here as a service for the RIT community and with this new app we hope to make ourselves more convenient and accessible to contact,” said Chris Denninger, director of RIT Public Safety. The idea for the app came when Irish began working with RIT Public Safety Investigator Tony Yazback to look for ways to increase the office’s modern technology presence. The app idea and infrastructure was developed into a business called CampusSafe, which won first place in RIT’s Fall 2011 Shark Tank competition. In winter 2013, Zach Potter, a fourth-year computer science student from Pittstown, N.J., was brought on to CampusSafe to help scale the app and ready it for commercialization. To get the app visit the Apple or Google Play store on your mobile device. To learn more, go to rit.edu/tigersafe and follow TigerSafe on Facebook and Twitter.